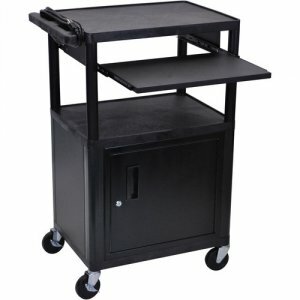 42 Inch Multimedia Workstation Cart with Locking Cabinet and Laptop Shelf - LP42CLE-B. 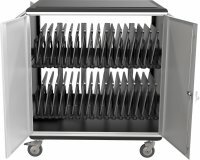 Versatile media cart or standard computer workstation with four shelves. Unit includes a pull-out laptop or keyboard shelf, surge suppressing electrical outlet and 4" casters, two with locking brakes.